DesignOnline | The Designer's Desk, inc.
You know how those big online print-on-demand retailers let you customize and order business stationery? We think that’s a great idea, because it allows you to choose from templates, make them your own and send them to press. But if you’ve used them, you know the marketing designs are either generic and suited for everyone (as in basic blue boxes and lines), or very specific to a niche market (as in coffee houses and florists). Choose from themes designed specifically for deposit, loan and other member promotions. 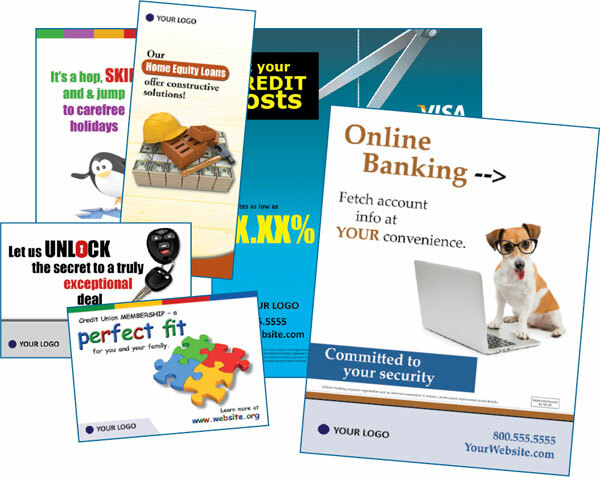 Upload your logo, add your rates, use our text or yours, change the colors, etc. Add other formats as needed to match. Download PDFs to proofread and share with your team. Send the materials off to press! The DesignOnline process lets you complete your project in a few minutes. We’ve posted a PDF tutorial on every DesignOnline template. And if you ever need assistance, call us at 1-800-582-0252 or email sales@thedesigndsk.com. Together, we’ll get your project ready to proof and off to press!